The changing dynamics of the global metal bonding adhesives market has lately been a point of intense discussion, given the product’s extensive application spectrum. Indeed, the continually expanding increasing range of applications that incorporate different kinds of bonding adhesives – from maintenance and repair to design and manufacturing have helped this industry significantly strengthen its stance in the specialty chemicals business space. One of the major reasons behind the adhesives’ popularity would be the fact that the product is extremely versatile and can be readily acquired in different levels of viscosity, electrical properties, chemical resistances, colors and cure times. The global metal bonding adhesives market – valued at more than $3.7 billion according to a 2017 estimate – is primed to witness substantial growth over 2018-2025, given its appreciable characteristics. Elaborating further, these adhesives are endowed with vibration resistance, abrasion resistance, thermal conductivity, chemical resistance, low outgassing, low coefficient of expansion and low shrinkage that makes them significantly superior to the conventional methods – nuts & bolts, welding, riveting or brazing – of bonding that were widespread across several industries before the advent of metal bonding agents’ advent. The metal bonding adhesives in the aerospace industry, commonly referred to as aerospace adhesives, have been extensively used since long for structural bonding – an application that has played a major role in aviation history. The use of adhesives along with aluminum has been an industry staple for a while now, and the combination has further enhanced airplane designs by optimizing durability and strength while allowing significant weight shedding as it helps spread the loads over considerably larger surface areas. A majority of adhesives used inside these applications are epoxy-based and are typically applied to the surface as a film – a practice that has been followed in the industry for several years. The demand for epoxy-based resins is expected to cross a considerable threshold in the coming years – a valuation of $450 million is anticipated for North America alone, due to the increasing repair, maintenance and overhaul activities in ageing aircraft fleets. Metal bonding adhesives market from aerospace applications would also be witnessing growth from the number of ongoing R&D activities that are being carried out by industry leaders to capitalize on the future potential of the aviation space. For instance, according to a report by Adhesives.org, NASA has been foraying into shape memory polymer composites (SMPs) – a new bonding technology – in an attempt to achieve adaptive wing structures. Initially only used in speed & performance oriented automobiles because of their ability to facilitate significant weight-cutting while also providing enhanced structural integrity, metal bonding adhesives have come a long way and are now incorporated in vehicle manufacturing on a large scale. The reason behind the wide-scale adoption of metal bonding adhesives in the automotive industry remains the same – to design & manufacture lightweight automobiles, in order to facilitate better performance and fuel efficiency while also enhancing the vehicle’s structural integrity. According to a 2017 estimate, automobiles & transportation held over 25% of the metal bonding adhesives market share in 2017. The revenue share is expected continue surging in the ensuing years, driven by the extensive advancements prevalent in the automobile manufacturing & assembling process. The global shift towards achieving more fuel efficiency to reduce carbon footprints and making automobiles safer for passengers and impervious to component breakage under stressful conditions would also be responsible for stimulating metal bonding adhesives market from automobile & transportation applications. Aided by a potentially expanding end-use landscape, the global metal bonding adhesives market is expected to continue growing at a remarkable pace in the years ahead. 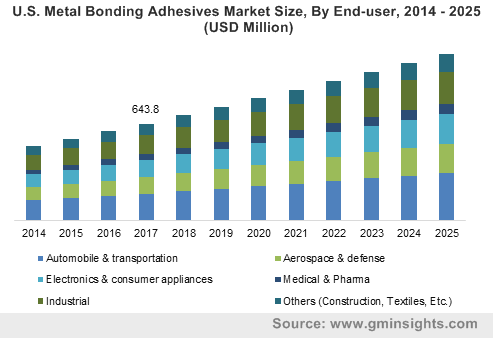 Driven by the rising demand for bonding adhesives across a plethora of different industries, metal bonding adhesives market size is lasted to surpass the $6 billion mark by 2025.